The following families have genealogy eBooks on this page: Biddle, Bishop, Buck, Downing, Fish, Johnson, Robards, Sanders, Shirk, Skillings, Stratton, Tisdale, Upson, VanderSloot, Vreeland, and Yardley. Welcome to Bookshelf 13 at Hawkeyes Trading Post! Biddle Family History and Genealogy or Genealogy of the Biddle Family with abstracts of some early deeds. PDF eBook English 4.53 MB 1895. 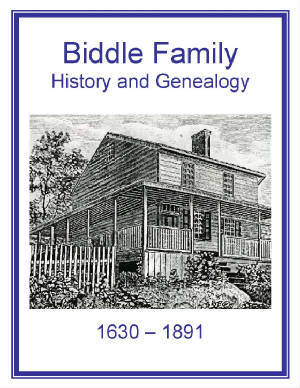 The family legend of the immigration to the American Colonies in 1691, and 5 generations of Biddle family members with essential dates ranging from 1630 to 1891 are all in this excellent publication! Indentured Servant Contracts, short biographical sketches, and pedigree charts are also included in this history! 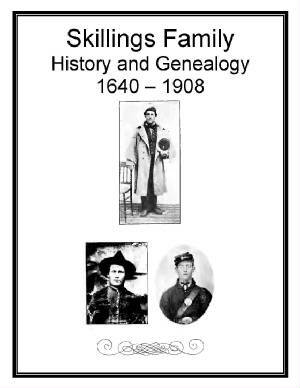 An outstanding genealogical resource for any Biddle family member! Price $6.95 USD. 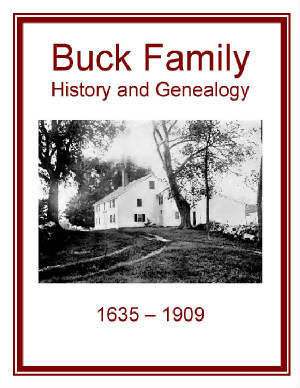 Buck Family History and Genealogy or Buck Family which settled in Cambridge Mass 1635. PDF eBook English 9.41 MB 1913. A brief narrative on the family origins in England is followed by an outstanding account of the Buck family in Scituate during the mid 1600s, 140 years before the American Revolution! 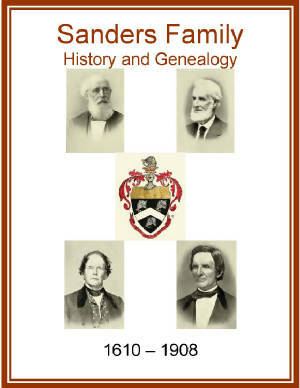 There are 12 generations in this publication with essential dates for ancestors that range from 1635 up to the year 1909! An essential resource for the family genealogist! Price $6.95 USD. Fish Family History and Genealogy or Descendants of Luke Fish. PDF eBook English 3.74 MB 1904. 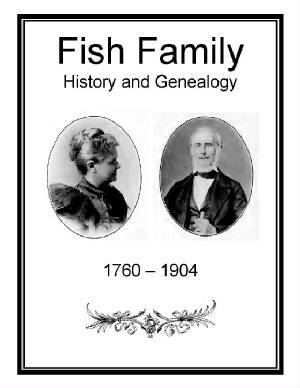 This eBook contains 39 rare family photographs of Fish family descendants! Essential dates with vital statistics of ancestors range from the year 1760 up to 1904. A period of over 140 years! An excellent genealogical resource with extraordinary information! The pictures alone are terrific! Price $6.95 USD. 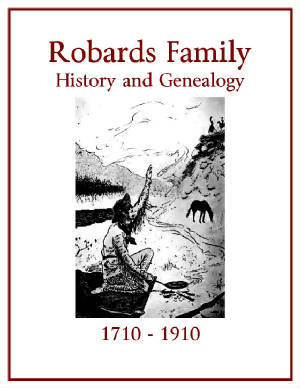 Robards Family History and Genealogy. PDF eBook English 12.6 MB 1910. The legend of the Welch origin of the family name is provided in this publication with essential dates of family descendants that range from 1710 to 1910! Photographs copied poorly since they had faded with time on the hard bound edition, yet the text is very readable and will provide a rich resource of 300 years of Robards family genealogy! Price $6.95 USD. Shirk Family History and Genealogy. PDF English 6.35 MB 1914. This eBook has a rich history of family stories and short biographies that begin with Ulrich Shirk being born in the Canton of Berne, Switzerland in 1665. The family immigrated to America in 1729, and settled in Lancaster County, Pennsylvania in 1732. There the 6 brothers, 2 sisters, and their parents farmed 2000 acres. Essential dates stretch from 1665 to 1914 with descendant’s births, marriages, et cetera! 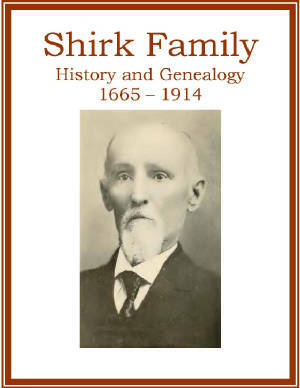 A real treasure of genealogy for the Shirk family! Price $6.95 USD. Stratton Family History and Genealogy or Stratton Genealogy of Long Island. PDF eBook English 6.00 MB 1901. Richard Stretton of England immigrated to East Hampton, Long Island, in 1643 and was followed by his brother John in 1648. The Stratton’s are identified with the settlement of Long Island since 1648. Essential dates for family descendants extends from 1619 up to the year 1894! 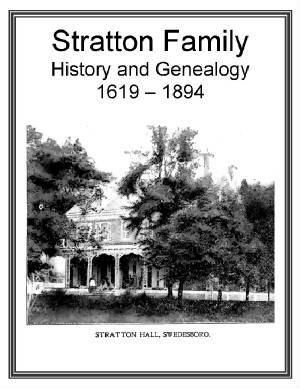 That’s 275 years of Stratton family history! This is a wonderful genealogical reference for any family member! Price $6.95 USD. 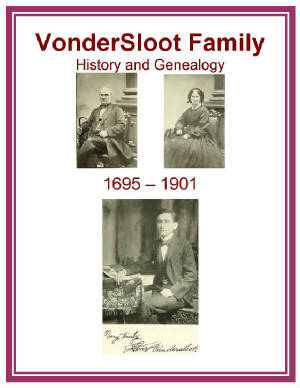 VonderSloot Family History and Genealogy. PDF eBook English-Dutch 4.73 MB 1901. The legend of the “von der Sloot” name with its derivation and significance with numerous rare family photographs are contained in this remarkable publication! Essential dates range from 1695 to 1901 provide vital dates for family descendants along with poetry composed by VonderSloot ancestors of long ago. The VanderSloot family name also descends from these ancestral roots. A great resource for the family genealogist with a wealth of kindred information! Price $6.95 USD. 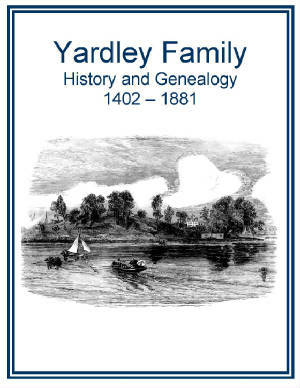 Yardley Family History and Genealogy. PDF eBook English 6.26 MB 1881. This extraordinary account details essential ancestral information that extends from the year 1402 up to the year 1881! Over 475 years with a 12 page index listing over 800 family members and in-laws! An abundance of genealogical information for anyone with this surname! Price $6.95 USD. 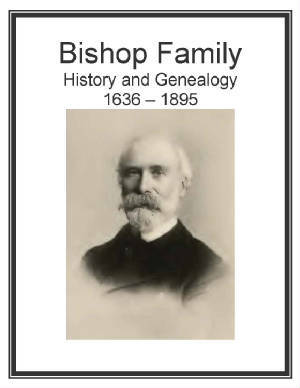 Bishop Family History and Genealogy or The Genealogy of Samuel and John Bishop brothers. PDF eBook English 2.22 MB 1901. The Bishop family history unfolds during the founding period of Ipswich, Massachusetts in the mid 1600s. The two brothers: Samuel and John, carve out a livelihood with intermittent conflicts with Native Americans revealed. Short biographies, several rare family photographs, and essential dates for descendants that range from the year 1636 up to 1895 are included in this eBook! A great resource of genealogy for any family member! Price $6.95 USD. 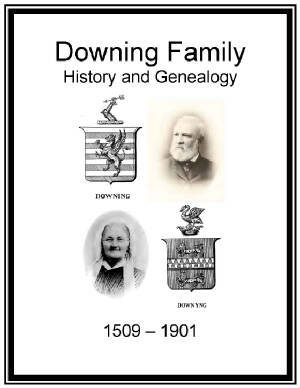 Downing Family History and Genealogy. PDF eBook English 7.15 MB 1901. The ancient legend of the Anglo-Saxon origin of the family name is presented with essential dates of family descendants that range from 1509 up to the year 1901! Also, there are pedigree charts containing names and dates that provide the tree showing the Downing family roots! A great genealogical reference! Price $6.95 USD. 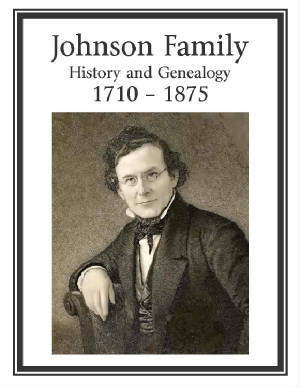 Johnson Family History and Genealogy or Records of the Descendant of David Johnson. PDF eBook English 5.19 MB 1876. There are several rare photographs, delightful poetry written several centuries ago, and 7 generations of descendants listed in this fascinating publication! Essential dates for descendant records range from 1710 and extend to the year 1875. There is also an index listing over 500 descendant and related family members! This is a treasure of Johnson family genealogy from the Victorian age! Price $6.95 USD. Sanders Family History and Genealogy. PDF eBook English 2.49 MB 1908. John Sanders married Alice Cole February 4th of 1610 in Wiltshire, England then immigrated to the American Colonies in 1630. Essential dates for hundreds of descendants range from 1610 to 1908 with numerous rare family photographs in this extraordinary publication! A must for any Sanders family genealogist! Price $6.95 USD. Skillings Family History and Genealogy or Memoir of Robert F. Skillings with Genealogy and Poems. PDF eBook English 2.78 MB 1911. A very well written account of Skillings family life during the early American Colonial period! There are 10 generations, numerous rare family photographs, and poetry written by family members long ago all wrapped up in this charming publication! Essential dates range from 1640 to 1908 for the family records of Skillings descendants! A wonderful source of documentation for the family genealogist! Over 260 years! Price $6.95 USD. Tisdale Family History and Genealogy. PDF eBook English 3.36 MB 1909. The family legend of the origin in Wales, numerous rare ancestral photographs, and the immigration to the American Colonies in 1637 are documented in this detailed publication! Essential dates stretch from 1637 up to the year 1909 on family descendants. 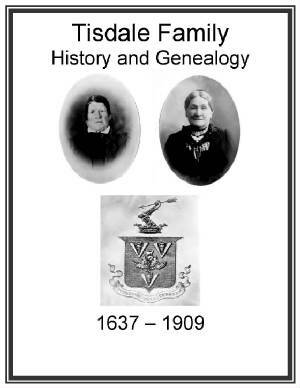 An excellent genealogical resource for Tisdale family members! Price $6.95 USD. 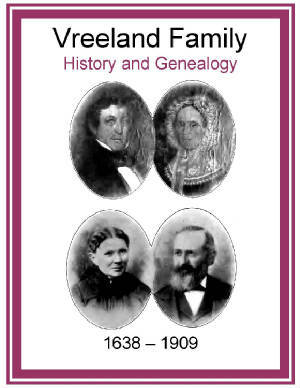 Vreeland Family History and Genealogy. PDF eBook English-Dutch 14.2 MB 1909. An extremely well written history with legendary family origins to 1585. There are numerous rare family photographs, poetry written by descendants, map, crest, and the history of the town of Vreeland, Holland. Essential dates with descendant information ranges from 1638 to 1909. Over 270 years of Vreeland history! This is an amazing resource to extend the family genealogy back for many generations! Price $6.95 USD. Upson Family History and Genealogy or the Genealogy of the Upson Family in America. PDF eBook English 1.39 MB Year 1900. Thomas Upson sailed from London to the American Colonies in 1635 aboard the good ship Increase. He helped build colonial America. Essential information on Thomas and his descendants extends from the year 1635 to 1898 with 24 pages of noteworthy biographies and hundreds of family kindred. Over 260 years of vital dates may be unique to this publication! 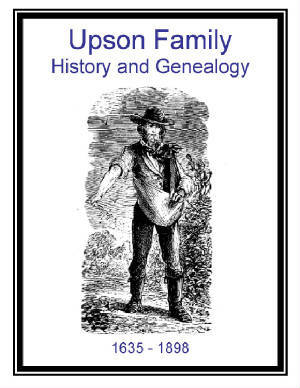 A great genealogical resource for the Upson family! Price $6.95 USD.